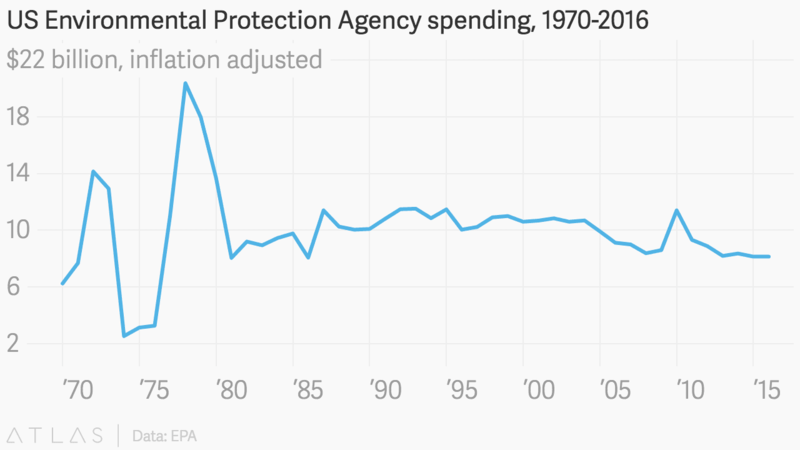 While the Trump administration intends to ramp up defense spending, it also intends to slash spending for environmental protection, revealing once again is corporatist agenda for 'Merica. 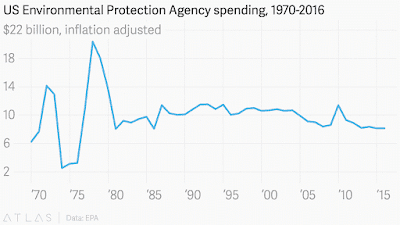 This chart shows that EPA's budget as a percentage of total federal spending has been relatively flat since the halcyon days of the late seventies under President Jimmy Carter. Added testament to the Trump government's motto of profits before the planet is his decision to resurrect the environmentally disastrous Keystone XL Pipeline that the previous administration decided to cancel. The pipeline would carry 800,000 barrels a day of climate wrecking tar sands crude from Alberta to US refineries. Insult to injury is his threat to take the United States out of the landmark Paris climate agreement.